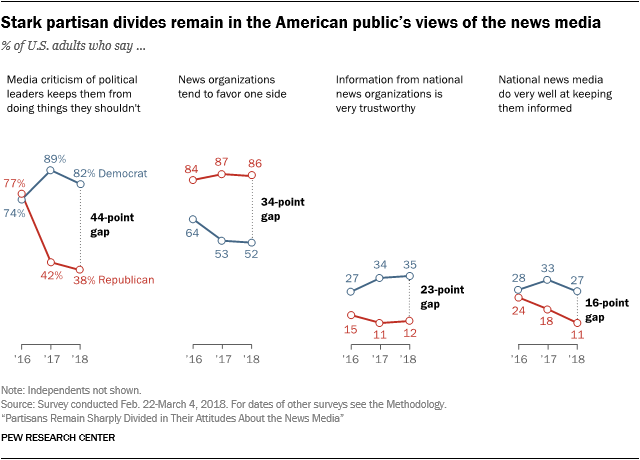 Specifically, strong divisions between Republicans and Democrats persist when it comes to support of the news media’s watchdog role, perceived fairness in political coverage, trust in information from both national and local news organizations, and ratings of how well the news media keep people informed. 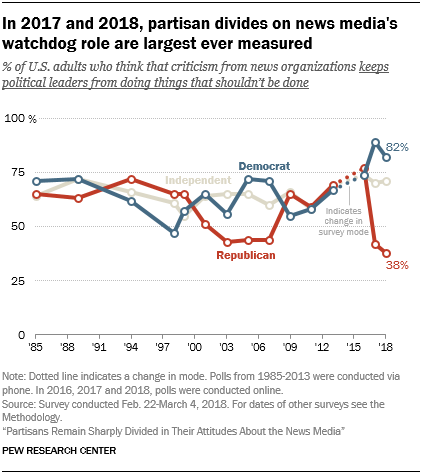 Americans are particularly divided politically on whether or not they think news media criticism keeps political leaders in line – the so-called “watchdog role” of the news media. A vast majority of Democrats (82%) say in the survey conducted earlier this year that they support the news media’s watchdog role, believing that news media criticism keeps political leaders from doing things that shouldn’t be done. On the other hand, the majority of Republicans (58%) think news media criticism gets in the way of political leaders doing their job. The 44-percentage-point gap between Democratic and Republican support for the watchdog role (82% vs. 38% respectively), along with the 47-point difference last year, are the largest measured by Pew Research Center in the more than three decades the question has been asked. In contrast, members of the two parties were about equally likely to support the news media’s watchdog role in 2016 during the Obama administration. Most Americans also continue to think the news media favor one side when covering political and social issues. About two-thirds (68%) say this, compared with three-in-ten who say they deal fairly with all sides. And as in previous years, Republicans (86%) are far more likely than Democrats (52%) to say news organizations favor one side. Further, the findings reveal low levels of trust in social media as a source for news and information among the public and members of both parties. While one-in-five Americans (21%) have a lot of trust in the information they get from national news organizations, that share is about five times as high as the portion that have a lot of trust in the information they get from social media sites (4%). And few Republicans or Democrats express a lot of trust in the information they get from social media (3% and 6%, respectively). Additional questions shed light on some of the nuances in how the public may evaluate trust. Although a minority of Americans (21%) express high levels of trust in the information they get from national news organizations, most are confident in the accuracy of news content: 71%, including majorities of both parties, go into a national news story expecting it will be largely accurate. 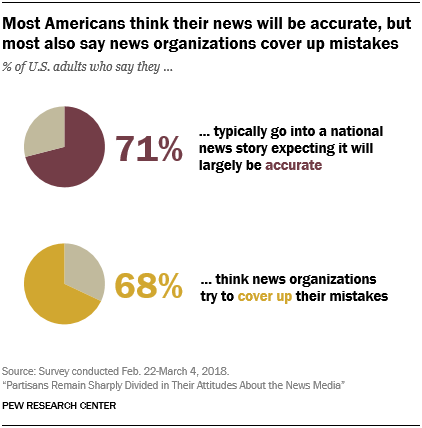 At the same time, though, a similar portion of Americans (68%) lack confidence in news organizations’ willingness to admit when they have made mistakes. And many Americans tend to feel disconnected from the news media. A little more than half (58%) say news organizations don’t understand people like them, and about the same share (56%) says they do not feel particularly connected to their main sources of national news.